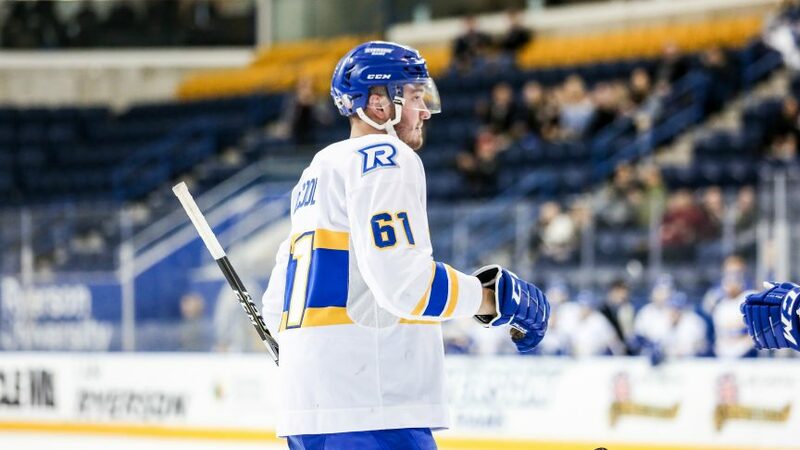 The Ryerson Rams men’s hockey team lost their second straight game to end the first half of the season, falling to the Brock Badgers by a score of 4-1 on Dec. 1. Coming into the game, the Rams were looking to bounce back after a tough 5-4 loss against the University of Toronto on Thursday. However, for the second game in a row, the Rams would start off playing flat. Within the first ten minutes, the Badgers capitalized on the few costly mistakes, and the Rams found themselves trailing by three goals heading into the second. Although the Rams outshot Brock 15-12 in the opening period, they were unable to get past Brock goaltender Logan Thompson. However, things began to look bright for Ryerson in the second period. Merely a minute into the period, forward Matt Mistele made a gorgeous move to set up Mathew Santos to cut the lead at 3-1. Following that goal, the Rams were unable to generate scoring opportunities and get back into the game. The home team caught themselves on an odd-man rush, which would eventually allow the Badgers to restore a three goal lead at 4-1. Aside from the physical play increasing, nothing would change for the Rams and the Badgers would come away with the victory and shorten the gap with the Rams for the top place in the division. With the loss, the Rams finish the first half of the season with a 12-3-1 record, and remain atop the OUA West. UP NEXT: The Rams will have the opportunity to look past their second straight loss and avenge themselves, when they travel to to St. Catharines to take on the Badgers on Jan. 4. Puck drop is scheduled for 7:15 p.m.